Midnightsky Fibers: Classes and Handspun Socks! These are from before I was doing only natural dyes, so I think they are prochem dyes (my favorite dye by FAR as far as chemical dyes. IMO more light fast and better color results and ranges than many others. About as good as a dye you can get without being an actual huge dye studio. 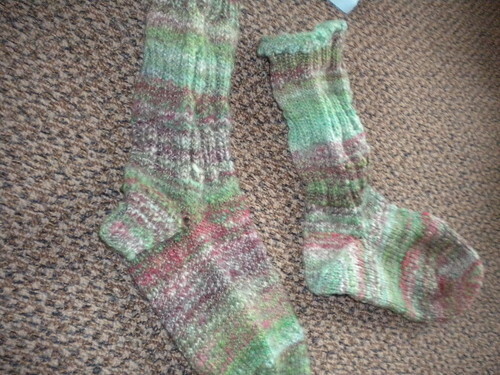 A simple 2 ply yarn, with ribbing to help keep the socks up. This is fiber someone gave me I think. Has silk in it, which was fun to spin, but I spun it up a bit thicker than I would normally like for socks. 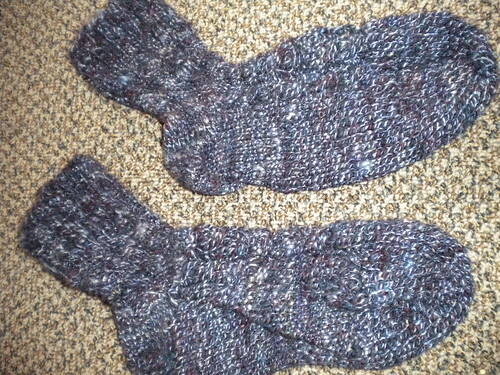 Cables and ribbing, but you can't really see them even in person since the yarn is so tweedy.